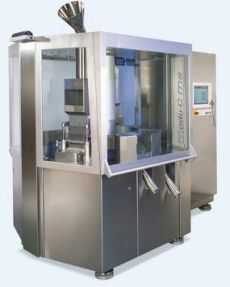 The Modu-C LS was especially designed for the pharmaceutical development up to small series production. The patented trolley system allows for easy and rapid dosing system changeovers thus offering the basis for flexible capsule filling. KPG - polishing machine for hard gelatin capsules - the component for clean processing. In the manufacture of hard gelatin capsules fall to the finest powder and gelatin residues. These are completely removed during the polishing process in capsule polisher KPG. The AccuraC is the best solution for the quality control of capsules. In-line with the Harro Höfliger Modu-C product family as well as a stand-alone machine it weighs capsules safely, precisely and reliably. A results evaluation allows appropriate adjustments to the filling system during production. 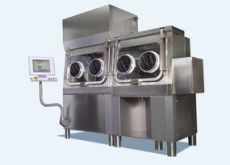 The machine was designed for easy operator control and short cleaning times. The Omnicontrol stands for maximum flexibility in the 100% control of capsules, tablets and coated tablets due to its format-free weighing feature. 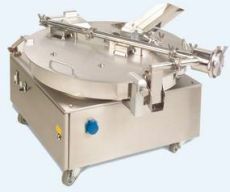 The ingenious and patented rotary star principle for product sorting ensures highest process reliability. The Omnidose TT consists of a pneumatic unit to control vacuum and compressed air as well as the drum dosing system. The system is operated manually and makes it easy to begin examining powder samples in the laboratory. An expansion from laboratory scale to small series production up to full scale production is possible without difficulty. For the Walletproduktion high-performance applications, we are the market leader and technology partners. Harro Höfliger machines process the most different carton blanks and special blister packages. Package contents of all kinds are fed and packed without difficulty. In addition, we provide you with everything that is required for printing, marking and labeling of your product. Of course, every process can be directly combined with product manufacturing. The multi-product package provides variable options. The top-loading process many different components can be integrated in one package. The top-loading process has in terms of flexibility, efficiency, ergonomics and efficiency advantages over horizontal cartoning it. Medical products are adapted in form and function always to the local application. Medical products are applicated in various parts into human bodies. Therefore, these products must be adapted in special forms. To facilitate the easy handling in daily use, these products and all packaging are often equipped with corresponding features. From process development to production line - everything from one source. The market for oral film strip carries a big potential. Initially oral film strips are used as a pure "Refresher" on everyone's lips, now the big pharmaceutical companies have recognized the versatility of oral film strips to the administration of drugs. This leads to one more aspects: the children's safety product packaging. granules, the four side seal bag is a cost-effective and consumer-friendly packaging solution.